Burn baby burn! Love is in the air as Disco Voltar is here with a funky groove. He won't stop 'till he gets enough, and this daddy cool will make sure everyone is stayin' alive. 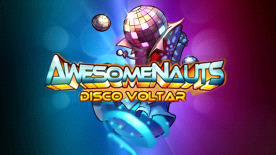 Lose that brainjar and party like it's 2399 with Disco Voltar! Boogie on! Includes funky healbot music! This DLC contains a custom skin for Voltar in Awesomenauts, and will automatically unlock the character if you have not already done so.